With the right government leadership, the new normal for sustainable transport in Chinese cities will include more transit-oriented development, shared mobility services, and transport innovations from the private sector. Photo by Taro Taylor/Flickr. Transit Metropolis – administered by the Ministry of Transport – is a national program that aims to promote transit-oriented development (TOD) and high quality transit services. On October 15 and 16, 2014, the Ministry hosted the 4th Transit Metropolis Forum as one of the program’s regular capacity-building efforts. The event was held in Shenzhen, China, which is the first city to incorporate the Transit Metropolis program strategies into its city development plan. The event had over 400 attendees, including policy makers from over 30 Chinese cities, private companies, academics, transport experts, and NGOs like EMBARQ. It served as a peer learning platform to explore state-of-the-art sustainable transport solutions, share emerging opportunities, and shape new trends. The theme of this year’s gathering was “innovation and harmony,” and it covered topics related to improving quality of life and implementing Transit Metropolis priorities, including transit planning and operation, urban planning, and information technologies. Solutions emerging from the forum discussion have the potential to be mainstreamed in Chinese cities for years to come. Globally, cities lead the way in innovating for sustainable transport. A recent study from EMBARQ, which EMBARQ China Director Haitao Zhang highlighted during the Transit Metropolis Forum, showed that many sustainable transport measures like bike-share and bus rapid transit (BRT) are at tipping points. Nonetheless, the same study revealed that Chinese cities are not the ones pushing this trend forward. Many sustainable transport solutions, such as congestion pricing, complete streets, and low emission zones have yet to become mainstreamed in Chinese urban policy. For transport innovation to become a widespread norm, it takes more than mere replication. Institutional barriers, contextual differences, capacity constraints, and path dependency are common roadblocks that prevent new ideas from being adopted in Chinese cities. Given these challenges, what are the sustainable transport pathways that fit the context of Chinese cities, and what emerging trends in sustainable transport can we expect for these cities? Fueled by booming rail transit construction in China, transit-oriented development – a strategy that promotes dense, mixed-use, and walkable development near transit stations – is gaining momentum. Shenzhen and Shanghai, among others, are spearheading TOD around transit stops. Despite a small number of ad-hoc projects, multiple barriers exist to translate TOD from rhetoric to reality in China. Forum speakers admitted that many critical elements for successful TOD planning and implementation are missing. For example, rail transit plans are often developed without adjustments to city master/regulatory plans, and regulatory zoning codes around station areas are too rigid to allow for up-zoning or mixed land uses. Moreover, stakeholder engagement that matches projects to dynamic market demand is unfortunately absent in the current planning process. Forum speakers suggested that future efforts should be geared towards reforming planning systems and working across silos to coordinate among different government departments and work with developers. Recent national policies have signaled positive changes to enable TOD. For instance, the recent issuing of the State Directive 64 opens the door for dense, commercial developments directly above and underneath regional railway stations, and allows for land value capture to support the otherwise costly railway construction. Transit ridership in Chinese cities is expected to grow rapidly. Forum participants noticed that to accommodate this sharp rise in travel demand, the sole emphasis on subway expansion is insufficient; the future of urban mobility should be multimodal, integrated, and cater to varying travel needs. A few mobility trends are gaining momentum in Chinese cities to complement subway systems. For example, BRT is now operating in 21 Chinese cities. The diversity of BRT system designs – which include systems on elevated highways, boulevards, and minor streets – show that technology and design innovations for BRT are endless. Another complementary transport option to subway systems is high-end commuting shuttle services. These services target high-income families and are also building momentum in China. Invented in Beijing, this flexible-route, subscription-based transit service provides both reliability and comfort that high-income households love, and has great potential to attract existing car drivers. Moreover, shared mobility options such as car-sharing and carpooling that were once restricted in Chinese cities have also recently grown. Forum attendees highlighted great opportunities for innovation and entrepreneurship by the private sector to provide “smart” sustainable transport solutions. Indeed, leveraging private sector innovation and investment can not only unlock business opportunities, but can also complement public policies. Smartphone technology plays an increasingly prominent role in transport in Chinese cities, through smartphone apps to hail a taxi, track arriving buses, or vote for a proposed change in bus routes, and through providing “big data” that informs policy-making. For example, the popular taxi app Didi – developed by a grass-roots start-up in China – has achieved a large market share in only two years, receiving over 5.5 million daily orders, reducing CO2 emissions by 40 metric meters per day, and unlocking millions in private investments. Forum attendees also suggested that for these innovative services to be mainstreamed, governments must create proper incentives, ensure fair competition, and make data publicly available. The impact of urban transport systems on economic opportunity, human wellbeing, and climate change are determined by the choices city leaders make today. Although the forum outlined possible trends in sustainable transport for Chinese cities, these transport solutions will require cities to have visionary leadership, creative thinking, and a vibrant market. EMBARQ China is supporting this process by working in many Chinese cities to catalyze the adoption of innovative sustainable transport solutions like transit-oriented development and land value capture, low emission zones, BRT, and car-sharing. 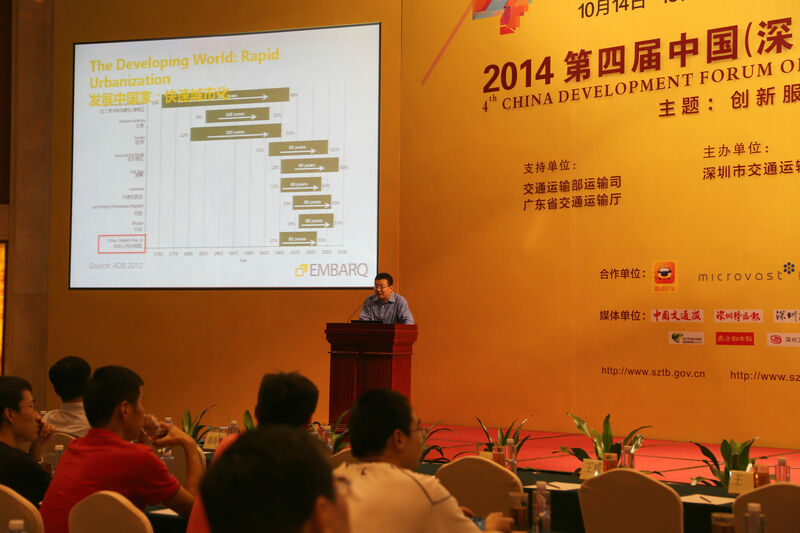 Read more about EMBARQ China’s work here. Haitao Zhang shares potential future trends in sustainable mobility for China's cities at the Transit Metropolis Forum 2014. Photo by Shenzhen Metropolitan Transport Research Center/EMBARQ China.